Drip...drip...drip...Those were the sounds I heard coming from the family room floor one day. Upstairs, my wife was taking a shower. Downstairs, our modern-shag carpeting was turning into a swamp. As I quickly brought my eyes to the ceiling, I saw beads of water forming across the painted ceiling texture and then dropping down. It was official: something was terribly wrong with the bathtub plumbing or shower in our master bath. A burst pipe? Oh lord, no... Either way, there was definitely an abrupt ending to my wife's shower that day! After much investigation it turned out our new family room water feature wasn't due to the bathtub plumbing specifically...instead, it was just the poor sealing around the bathtub. During showers, water was escaping, making its way down the tub, through the floor and into the downstairs ceiling. We recovered and resealed successfully to stop the problem; but things could've been a whole lot worse when you consider the possibilities for catastrophe with the amount of water coming out of showers and baths. There truly are many factors at play when it comes to bathtub plumbing troubleshooting, it can leave even the most seasoned DIY homeowner befuddled when there's a problem. Often you're left with calling in the plumber; and while it's true you may need one at times there is much you can on your own... even if you have no clue at first what's going on like I did when I saw water pooling on our carpet! Below you'll find all the clues you need to A) diagnose, B) fix and C) prevent bathtub plumbing problems. Whether you're in crisis mode over a leak, clog or some kind of broken part, the basics are here. Let's get your bathing experience back to where it should be: calm and refreshing without a care in the world! Bathtubs and showers are like giant sinks, except that their components, like faucets, are bigger making them seem more complex. And unlike a typical sink, there's the issue of accessibility. How do you get to pipes and drain traps anyway? Did our ancestors just have it easier, bathing in lakes, rivers and rain water? Let's tame your intimidation and take a look at what makes up your bathtub's plumbing. We'll start with things you can see, then dive into things you can't see behind walls and below tubs. As you become acquainted, you can gear up to solve some of our favorite bathtub plumbing issues discussed below. Faucets, spouts, and drains...Easy! We see and use these everyday. Faucets are the valves you turn or pull to get water to come out and set your desired water temperature. You might also turn one to turn a bath into a shower. Valve types in bathtubs are usually either compression or cartridge types. Compression faucets are the two-handle, twisty variety. Behind their outer handle you'll find a stem and a packing nut. To facilitate movement, compression faucets use a rubber O-ring and seat washer. These last two guys sometimes need replacing when you your faucet starts to leak. 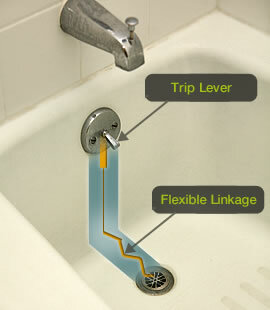 Cartridge faucets have just one handle, and work using a pull/push (on/off) motion. When you take the outer handle off, you'll find a single cartridge valve strapped in with a retaining clip. When things go wrong with these faucets, you almost always fix it by replacing the whole cartridge. Sometimes, replacing an O-ring gets them working again though. Tub spouts direct water into your tub, and often have a basic diverter valve attached to route water up to a fitting with the funny name of "drop-eared-ell" which your showerhead the attaches to. Otherwise, your shower may have a third compression valve to tell water to go up or down depending on your bathing mood. Tub and shower drains are obvious, right?.A main one on the tub or shower pan floor takes dirty water away, and a second one higher up keeps the tub from overflowing. Of course you can see drain openings and faucets, the front side to your bathtub plumbing. And if you're lucky enough to have an access panel on the opposite side of the bathroom wall, you'll see some of your bathtub plumbing insides as well. These "secret" doors are very useful during troubleshooting and repairs because you can get to important pipe connection points and drain elbows. If you're not so lucky to have one, don't sweat it too much. You may never actually need it...and if you got desperate, you can add one in if you can get to the other side of the wall and are handy with a saw. Supply pipes, drain pipes, trips...Straightforward enough, but check out the photo to get acquainted with where this stuff is. It just might shed some light if you're perplexed on where a clog or internal leak might be. Hint: check out the elbows in the drain pipes. These run behind the wall of the bathtub's faucet. This is where water comes into your bath. There is one each for incoming hot and cold water. With a shower, there is a single one going up with the hot/cold mix. If you ever wonder why it takes a while for your bath/shower water to heat up, it's because hot water has to make it's way through a dedicated pipe from your water heater. The cool water that comes out initially is what's been sitting in the length of pipe since the last time you took a shower. Some people save this water and use for watering their garden! These attach to your tub at the tub's base (waste drain) and just below the spout (overflow drain). These two join together in the floor under your tub and go to your home's main drain line. A larger pipe than any others, the main drain continues out to the sewer line, leaving your house for good down near the foundation. To open and close the waste line, you use a trip lever that's part of the trip waste assembly. Moving the lever lifts and lowers a "pop-up" stopper or cylindrical plunger within the piping. It's literally has a chain plumbers call linkage. It's a clever assembly; and when it works, you love it and don't think twice about it. When it doesn't work, it can be irritating because your tub won't drain very well OR stay filled up! Finally, it's worth mentioning the containing structure of your bathtub or shower. These components are the tub, shower pan, walls and/or doors. While they aren't exactly bathtub plumbing parts they may need your attention just the same when it comes to leaks and the quality of your bath or shower experience. If you mention a plumbing issue with your bathtub I automatically think of a clog, leak or broken faucet. Okay, there isn't much left that can go wrong, but these are the big three so to speak. At the top of this list however, we find the ever-popular clogged bathtub plumbing scenario. Hair, soap scum, along with forgotten bath toys, can really jam up the works. You don't have to call the plumber in most cases since the blockages usually occur between the tub's waste water drain inlet and the bathroom wall where it meets up with your house's main drain. With the right tool you can get things cleaned out. The worst part is when you see the sludge that comes out. Not always pretty and definitely doesn't smell like roses... but it's important to remove for both your sanity and state of your plumbing. We turn them, pull them, push them, and just plain abuse them. Faucet handles are made to last as are the valves they control inside. But depending on your water type, age and care, things can go wrong over time. On the outside, most problems occur with handle parts. A screw falls out, plastic cracks form or threading wears out. These parts are all easily replaceable. For higher-end all metal faucets, you can expect minimal repairs to these external parts over your lifetime. Bathroom fixtures are truly a get-what-you-pay-for game. For most of us though, we have the under $50 models instead of the over $200 varieties. Yep, ca-ching! On the inside, expect valves to need replacing every so often. If you're lucky, you can go 15 years depending on frequency of use. If you bathe every day, and have high mineral content in your water, you may only get a few years before needing a new cartridge valve, or O-ring replacement in compression types. You'll know it's time for replacement when water begins leaking from where the handle meets the wall; or worse, if water stops coming out at all! As just mentioned, many leaks occur when rubber washers wear out or valves become compromised by age or hard water. But that's only at the faucet...what about other places? Bathtub plumbing leaks are notoriously happen at the over-flow drain opening. A rubber gasket here is the only barrier between a tub full of water and soap bubbles and the floor below getting washed with sudsy water. This seal can corrode and crack over time. It's an easy replacement that can save you lots of dollars in potential damage! When you have a shower in the bathtub plumbing mix, there are a few more parts you become aware of. Not to worry, since of course, it's usually stuff you can fix yourself for minimal cost... and sometimes at no cost at all. A showerhead leak can come about for a few reasons: Expanding connectors at the shower arm, cracking washers or dying water supply valves are the name of the game. Click the link above to learn how to stop the leak and keep your shower (and water bill!) in good shape. Be sure to use Teflon sealant tape whenever connecting showerheads for a leak-free fitting. A leaky shower stall can be due to a broken water pipe behind your shower wall, a bad seal at your drain opening, or even a cracked shower pan or tub. Often though, water going where it's not supposed to is because of poor seals at the joints in your shower walls or where the bathtub or pan meets the wall. Click the above link to diagnose and fix before it's too late! Shower diverter leaks are very common among our bathtub plumbing repair list. You use the gate diverter (the little knob that sits on your tub spout), to send water up the shower riser pipe to your showerhead. The internal pieces of this part are small, making them a prime target for mineral build-up. When this happens, they stick and eventually break. Wouldn't it be nice to keep clogs, leaks and other problems in your bathtub pumping from ever happening? The truth is, you can... but only to the extent that you want to exercise your proactive muscle. On one extreme, you replace washers in your faucets every year before they get old and fail... On the other side of the coin, you do nothing until one day you can't get your shower to come on at all. The happy medium then is to just take care of some routine maintenance to avoid nasty clogs and damage that comes from ignoring progressive wear-n-tear. Don't let clogs creep up on you (because they will!). Use a drain cleaning tool once a month just to keep things moving along. Another great way to keep bathtub plumbing unclogged is to use a screen on your tub's waste drain opening. These plastic or rubber gadgets stay in place while you shower, and you just discard the debris from them instead of fishing it out later from your pipes. In my story above I learned for second story bathtubs that "proper sealing protects your ceiling". At least twice a year, check your bathroom caulking carefully. Remove and replace any area that starts to crack or break away. I used to wonder why shower walls and tub surfaces eventually look dirty even though this is where you go to get clean! We all know that when we bathe, we actually dirty the tub and shower surfaces in the process. Throw in some hard water, and even the bathtub plumbing accumulates yucky stuff. You should regularly clean surface areas with bleach or a mild natural product to ward off sticky soap scum, calcium and mold. Work a soft brush around parts after pouring "CLR" or white vineger (to break down mineral deposits) over faucets, diverter tub spouts and showerheads. For tiled walls, check every six months for loose tiles or grout that's falling out. Chisel out any loose grout down to 1/16" and push in some new grout. This is your first line of defense against water escaping your tub or shower. Yes, it's kinda important! Depending on your usage, you might not use certain bathtub plumbing fixtures. Don't let parts get stuck or gaskets dry out. It's the "use 'em or lose 'em" philosophy. Turn, lift, pull and push things around from time-to-time in an unused bath so it's ready to go when it comes time.